Maria Charalampidou was born and raised in Thessaloniki. She graduated from the 15th High School of Thessaloniki. Having succeeded in national exams in 1995, she began her studies at the Dental School of the Aristotle University of Thessaloniki in Greece, from where she graduated in 2000. From 2000 to 2001, she worked as a dentist at the dental department of Ippokratio General Public Hospital in Thessaloniki. The focus of dental treatment was on dental emergencies, patients with chronic diseases and patients with special needs or disabilities. From 2001 she started working as a dentist in a private orthodontic clinic in Thessaloniki (Protipo Orthodontiko Iatrio), and at the same year she began a three-year postgraduate program at the Dental School, in the field of Preventive and Community Dentistry, with clinical focus on Pediatric Dentistry. 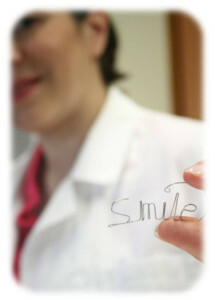 In 2004 she began the three-year specialist training programme in Orthodontics at the University of Gothenburg, Sweden. After completion of her research project, she acquired the Master of Science in Odontology (MSc) from the same university. Articles have been published in the scientific journals Acta Odontologica Scandinavica and Gerodontology and have been presented at conferences in Greece and abroad. She is a member of the Ηellenic Society of Preventive Dentistry (EPOE), the Greek Association of Orthodontic Study and Research (EOGME), the World Federation of Orthodontists (WFO), the European Orthodontic Association (EOS) and the Norwegian Orthodontic Association (NKF). Since 2007 she has been working in a private orthodontic clinic in Norway and in Thessaloniki (Protipo Orthodontiko Iatrio).